Today I am going to share another EmilydeMolly polish with you.. And it is one that I was destined to absolutely love. 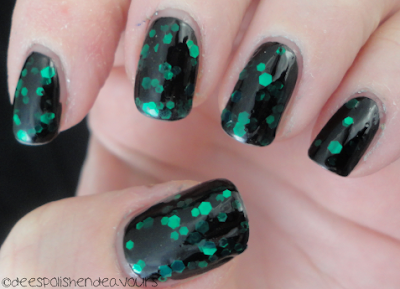 It is black based, with tiny black glitter AND large green hex glitter..
Sooo pretty! This was three coats of Black Forest over Orly Liquid Vinyl. Black Forest can be purchased HERE. I did matte-ify this, but, I kind of forgot to photograph it - well, actually, I thought that I had.. and I did not. Well, this is awkward. I hope everyone is having a great day and I will see you again tomorrow! Remember to go see Silver's post for today as well! !